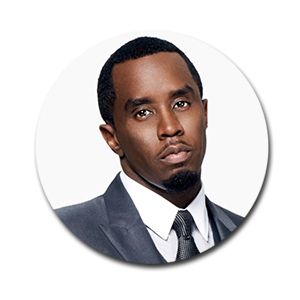 Most recently named one of the ‘One Hundred Greatest Business Minds’ of the century by Forbes Magazine, putting him among the ranks of people like Warren Buffett, Jeff Bezos, Oprah and others, Sean “Diddy” Combs aka Puff Daddy is the definition of a mogul. Starting his career as the director of A&R at Uptown Records, he was integral in launching the careers of Mary J. Blige and Jodeci, and later founded his own label, Bad Boy Records, which has fostered talent that includes Mariah Carey, Method Man, Boyz II Men, Lil’ Kim and more. Combs’ solo music career began in 1997 with his first single, “Can’t Nobody Hold Me Down,” which shot to No. 1 on the Billboard Hot 100, quickly followed by a No. 1 debut album that has gone Platinum seven times. Over the course of his career, he has earned three Grammy Awards and ASCAP’s Songwriter of the Year honor. Combs also has become an established actor and executive producer in both film and television. He starred in the 2008 telefilm “A Raisin in the Sun,” for which he won an NAACP Award for Best Actor; he was an executive producer and featured personality on the 2002 unscripted music series “Making the Band 2”; and he executive-produced the Academy Award-winning documentary “Undefeated” and the Academy Award-nominated “Mandela: Long Walk to Freedom.” Most recently, Combs joined forces with FOX to premiere a new music competition series entitled “The Four: Battle for Stardom,” which became the season’s No. 1 most social new television show, prompting the network to renew the series for its second season. Combs continues to apply the same drive and entrepreneurial spirit to his philanthropic work and political activism, most recently opening the Capital Prep Charter School in Harlem, advocating his lifelong commitment to supporting education and empowering future leaders. That same year, he pledged $1 million to the School of Business at Howard University, establishing The Sean Combs Scholarship Fund to shape a new generation of entrepreneurial leaders. He has supported organizations including the National Foundation for Teaching Entrepreneurship (NFTE), the Boys & Girls Club, and others that create opportunities for young people. He also has served on the board of the Hip Hop Action Network and rallied millions of young people to register to vote during the 2008 election, through his Vote or Die project. He raised more than $2 million for New York City public schools and children suffering from HIV and AIDS by competing in the New York City Marathon.